In my mind it’s called mmmummus. Because every time I think now I put the chickpeas to soak for making h … immediately my salivation increases, my taste buds stand up, my pupils dilate, the galaxies as well, and in my mind I just can feel a muffled sound in the silence, like a cosmic background radiation: mmmmmmmmmmmmmmmmmmmm …. If hummus were a number it would be the golden ratio of my aesthetic taste. There is only one problem. It gives addiction. And then I had to find a good chickpeas pusher. Hummus is very customisable but, as a purist-hummus-snob, I eat it exclusively as original recipe. Cooked chickpeas, homemade tahini, freshly squeezed lemon juice, garlic, extra virgin olive oil, salt, paprika, cumin, parsley to decorate. Point. Categorically forbidden to ask if canned chickpeas work too. But before we talk about the recipe, let’s talk about that bowl of water. Yes, that bowl where you usually put your chickpeas to soak. In that bowl you are putting on stage, without knowing it, a miracle of nature. I said unintentionally, so don’t be stuck up. But first things first. And here I become serious and my tone becomes dramatic. Soaking beans, grains, all the seeds in general, it’s very important to fully benefit of the nutritional value of these foods. The main objective of soaking is to remove phytic acid and inhibitors enzymes naturally present in all seeds. If ingested, the first one acts by chelation, binding iron, calcium and other minerals from the body and then limiting its absorption. The second ones inhibit and hinder fundamental metabolic processes. In reality, however, a closer analysis shows that these two thugs above are just the bodyguards of our seed. They help him to provide nourishment from the outside and to stabilize it till it is ready to sprout. They are not bad in fact, they simply do their work. Soaking gives your seeds a reason to sprout. Which is the primary aspiration of every seed. I’m about to sprout! Yeeesss! Exults our friend chickpea. Nope. We reply. Your destiny is to be hummus. Poor deluded. And now we can eat our chickpeas. The activation of sprouting by soaking, in fact, removed phytic acid and inhibitors enzymes. We have two possible choice: eating them raw (when sprouted) taking the maximum benefit or, as in the classic hummus recipe, cooking them. 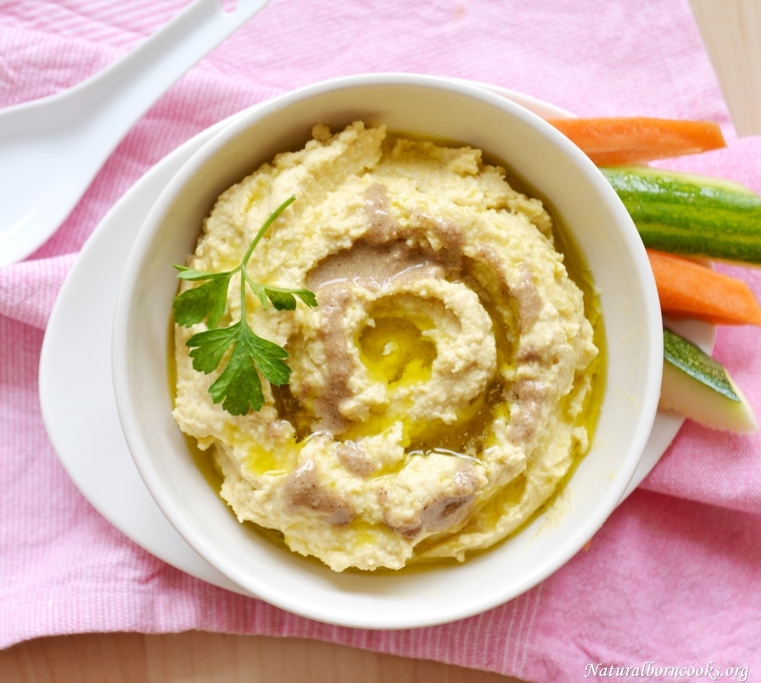 I made raw sprouted chickpeas hummus several times, and it is delicious. But that is another episode. 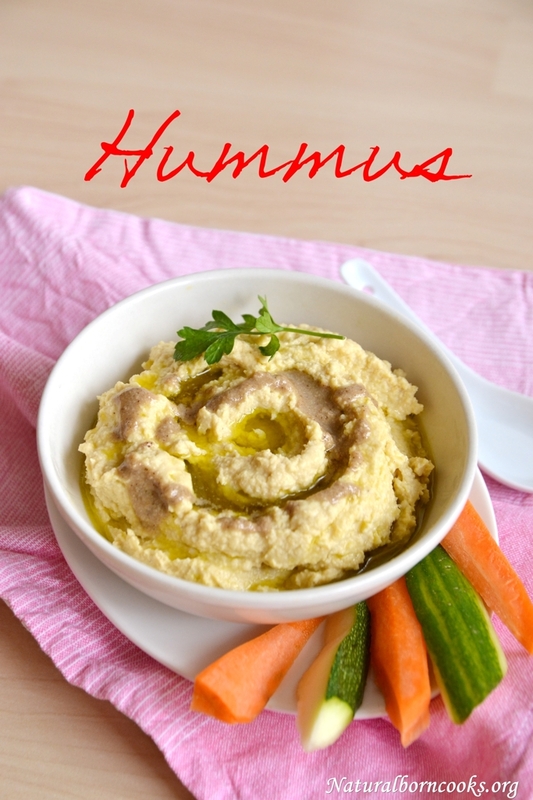 For now here’s my classic hummus recipe. That rather than a true recipe with exact doses is a list of the basic ingredients, when I make hummus I always proceed by intuition and sampling (more sampling that intuition), you can modulate the amount of ingredients according to your taste. Ah, but first I have to talk about tahini! Here it is, another preparation that I love and that is super eclectic because it can be used both in sweet and savory, snacks or elaborate meals, alone or in combination with other ingredients to create exotic sauces with a subtle nutty flavor. Here it is, our babe, posing for the cameras, limply lying on this a seeds crackers. 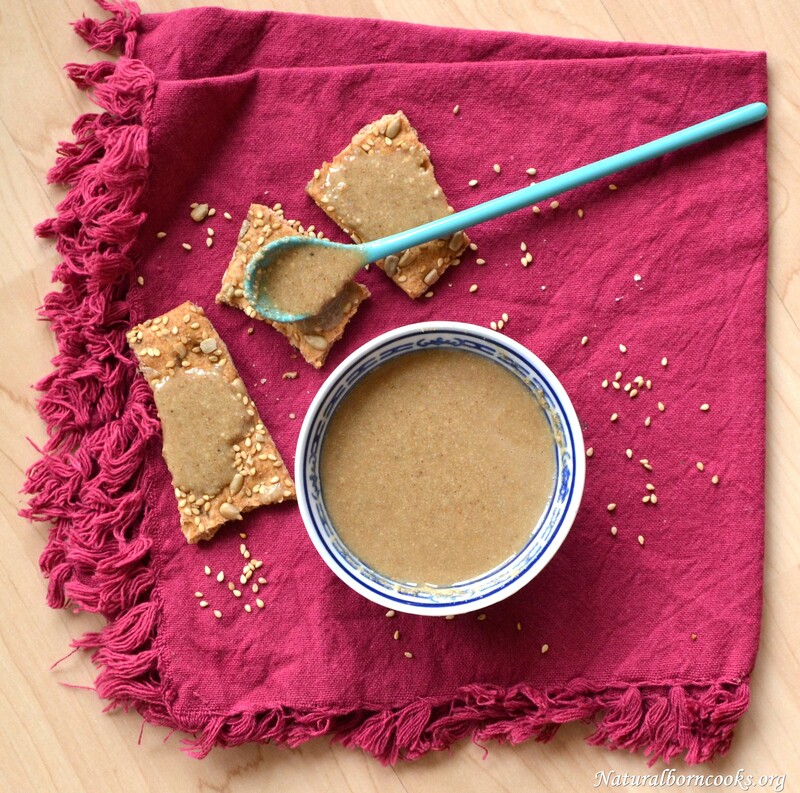 -in a small food processor put the sesame seeds with the remaining ingredients of tahini except for the salt. Blend until a smooth paste, modulate the amount of oil according to the desired consistency. Add the whole salt. The tahini is ready. -blend all the ingredients to obtain a smooth cream without lumps. Taste. Yes, with your fingers,, that’s the reason why I included hummus in the finger food category. Season with salt, decorate with paprika and fresh parsley.